My son sent me this photo from his travels ... a tea house walkway in Kyoto, Japan. Photographs of walkways, trails and paths hold so much meaning for the writer. I have photographed many paths. They serve as visuals for the writer's way … where will the words, the writing lead? This week my journey led me to my friend, who I hadn’t seen in over a year. She has been very sick. Serenity is elusive, especially for many older women. It’s not their fault. They have been victimized by a system tilted away from helping elderly women. She saw me and immediately ran out of the activities room, hugging me and in tears, distraught over her situation. We spoke at length about her circumstances and we ate a lunch of salmon and bagels I had packed. People on the ward were crying, shouting, holding baby dolls. Many are in wheelchairs and need to be spoon fed. This situation, my friend said, is contributing to her feelings of helplessness and hopelessness. Her despair. I want to practice Zen. Move forward yet remain in the moment, nonjudgmental, non-feeling, attached but not attached. She could be me … she could be any woman alone. Her face is haggard, drawn. A man was involved. Aren't they always? A lot of emotional anger that he took out on her. Still, she defends him. My journey has led me away from men, many of whom I view as unfeeling, domineering and controlling, predators even who use women and casually discard them. I won the lottery once, long ago. I'm not playing the odds anymore. My friend has no desire to be in a nursing home. She understands she can use help, but she said she feels she is being manipulated by "the system." Yellowish-red bruises under both eyes and a scab on her chin and lip attest to a recent fall on the sidewalk. She shows me her forearms, deeply bruised from her brief hospital stay after the accident. I want to think it was the system that caught her up in a maelstrom that consumes many of the elderly, although my friend is still in her sixties. But for now, all I can do is love her. Tell her that this is only a temporary situation. Her room contains a small bed; she shares it with a woman who can't speak. A pair of legging-type pants smelling of urine crumpled on her unmade bed. I remove them and put them outside in the hallway in hopes the nursing staff might notice and wash them. My friend, a writer, has no reading glasses. Someone gave her a book on dogs. I had brought her a novel. Three times I ask about getting her glasses. A social worker/nurse on the ward said she had some downstairs and would get a pair. This had not happened by the time I left three hours later. A flash of her old cynicism shines through. "This is a disaster. How did it come to this?" Then we reminisce. She remembers every detail of the day she introduced me to my husband. She is my best friend. And the memory returns of a warm July afternoon. She and I sit under elm trees at the battered wood picnic table in her parents’ backyard. We are twelve and thirteen years old. We play with Barbie and Ken dolls, our whole world dreaming of the day when we meet Prince Charming and he carries us off to happily-ever-after. Yesterday as I drove to the store, a man in a gray sedan pulled beside me, honking his horn, giving me the middle finger. “You c…! You cut me off,” he shouts through his rolled-down window. Had I? Perhaps, I hadn’t been paying attention. But why did he have to use that word .... the c word? What kind of a man is so angry that he feels women can be ground under his boot heel? Thoughts of how women journey into the darkness where a man is concerned often consume me. The news―from Bill O’Reilly to Bill Cosby―adds to the daily fare of abuse of women threatened with loss of career and, ultimately, their sanity. Some of my friends can't sleep, worried about the man they call "the Groper in Chief" holding power over their lives. Did my friend end up in this horrible predicament because a man took her for her house and money? Did he emotionally abuse her for years because he had no life, no taste of success and took it out on her? This is a cautionary tale; the fate of women, especially older women, if they are not careful. I wrote this, not just for people who need to know about my friend, and the woman she is, but for me, as a healing journey, to put things into perspective. Writing does that. It offers a window into the hazy blur of something almost beyond our comprehension. 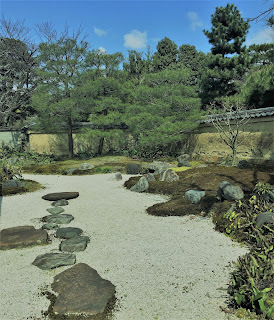 I look at the photograph of the tea house walkway; search for the serenity, relish the solitude, that Zen-like moment. For a writer this is essential. I have written about this before … as I have written about the cruelty of men, of the woman alone. I will continue walking this path to see where it leads. Do you have a story of a friend who finds herself in a desperate situation? Do you have a story of writing as a healing journey?